NEW DELHI, SEPTEMBER 11: Leading international not-for-profit organisations HRH Prince Charles’s British Asian Trust, the Michael & Susan Dell Foundation, UBS Optimus Foundation and Tata Trusts, together with the Comic Relief, the UK Government’s Department for International Development (DFID), the Mittal Foundation, and British Telecom have collaborated launched the world’s largest education development impact bond: “Quality Education India” Development Impact Bond (DIB). The first phase of the fund raised USD 11 million and the consortium wants to use this as a springboard to double the DIB in size in the coming years. With this new and innovative social finance tool, the consortium aims to improve literacy and numeracy skills for more than 300,000 children, drive focus towards outcomes in the development sector and transform the way education is funded in India. 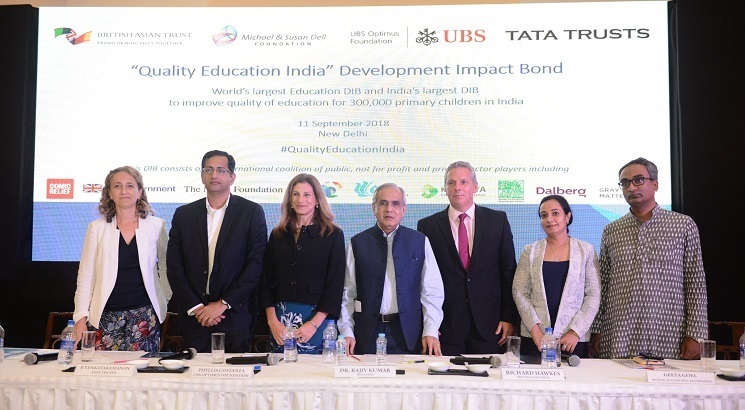 This DIB focuses on the quality of education through the delivery of specific measured outcomes of improved literacy and numeracy among children in India, as opposed to simply measuring the number of children in schools. India has achieved a 99% rate of school access, but quality of learning has remained poor. A typical Indian student is at least two grades behind the level that is expected for their age. It is critical that the attention is now turned to improved learning levels. Outcomes of the programme will be assessed by an independent evaluator, Gray Matters India. Dalberg Global Advisors serves as programme manager and will work together with local NGOs to maximise outcomes. The UK Government, through the Department for International Development (DFID), is also providing technical assistance to the programme, including funding for programme management, legal advice, learning and evaluation.